When a brand is new and growing, they tend to be freer—and often more fun and creative—with their content. A young brand’s very survival depends upon making a splash, catching attention, and being new and distinctly different. As a brand matures and new marketing talent is brought in, the tendency is to start looking toward the more established brands in the industry and embrace a slicker, cleaner, more consistent look and feel. Metaphorically speaking, many brands jump straight from cargo shorts and graphic tees to suits and ties, leaving the seemingly frivolous stuff behind. Then they find themselves in a conundrum. While the professional new attitude works well at certain points of the customer journey, it often falls flat higher up in the funnel. What’s a content marketer to do? Is it possible to be both fun and serious? Or do we have to embrace one and abandon the other? At Workfront, we’ve spent the last couple of years juggling and experimenting with the right blend of playful content—think zombies, superheroes, and the Nine Levels of Hell—and more authoritative assets that answer customer questions and pain points outright. 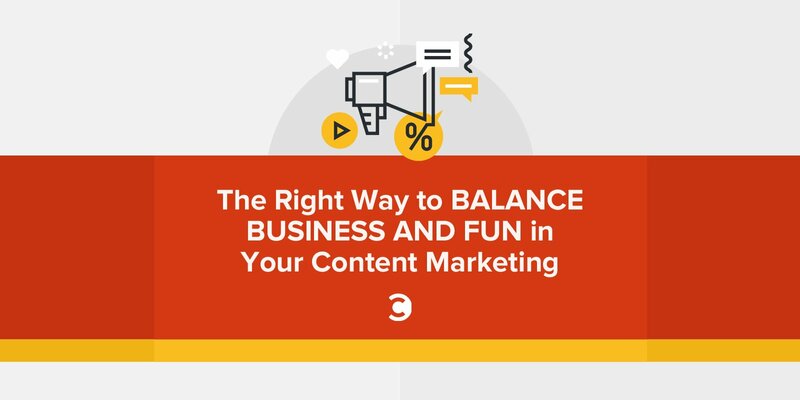 Along the way, we discovered five key lessons any content marketing team can use to more effectively balance the fun (a.k.a. engaging, creative, edgy) and the serious (a.k.a. direct, no-nonsense, buttoned-up) for their brands. What are people downloading, clicking, and responding to? Don’t forget to look at both social media and demand generation, which requires an open line of communication with the people who run your social media marketing efforts and PR. “My advice is to stay focused on the audience that engages the most,” both currently and in the past, says Rainey. “What content worked? What built the foundation of your audience?” Perhaps those wacky posts you released when your brand was young helped contribute to your current image in a significant way. It could be a mistake to abandon them completely. Content at the top of the funnel can be a very different animal than content at the bottom. Without a little fun or edginess, you won’t last long in the realm of old media and social media. But the closer you get to the point of sale, especially in B2B, the more corporate and authoritative you may need to become. It’s also important to realize that, even for bottom-of-the-funnel content, what sounds dry and boring to content marketers may actually be exciting to the intended audience—especially if it directly addresses their needs and questions. 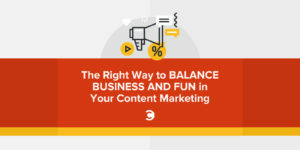 While you’re trying to find your brand’s sweet spot, remember that content marketing doesn’t have to be laugh-out-loud funny, heavily themed, or wildly creative in order to be effective. The most important thing is to be relatable and human, whether you serve a B2B or B2C audience. After all, even in B2B marketing, you’re trying to engage with the actual humans inside the business. Many brands fall into the trap of thinking that “knowledgeable” and “authoritative” are synonyms to “dry” and “boring”—that every effort to inject personality into the brand will undermine its prestige. But it is possible to be seriously helpful and somewhat playful at the same time. It’s common for branding guidelines to be built with a few types of content in mind, like ebooks, for instance, without taking into account how those guidelines will translate to social or the corporate blog. This can put content marketers in a difficult position. You either follow the guidelines to the letter to please your creative director, while failing to engage effectively with your audience, or you wow the audience but end up diluting and undermining the brand over time. You have to work with your individual art director or creative director to find a middle ground—and usually both parties will have to give a little. If you want to pull off campaigns that succeed across channels and up and down the funnel, they need to be built for flexibility, not for total uniformity on every piece that goes out. This goes for both messaging and images. I’ve frequently attended brainstorm sessions where great ideas didn’t make the cut, simply because they weren’t translatable to enough of our potential audiences and channels. The best concepts are those that can be adapted for a playful video to share on Facebook as well as an informative whitepaper or ebook. Of course, this tip mainly applies to big, multi-faceted campaigns that involve all levels of the marketing organization. The more juice you can squeeze out of that orange, the better. You’ll also be launching smaller, more targeted campaigns throughout the year. Keep an eye on which of those resonate the most; you never know when a lone-wolf asset will inspire your next comprehensive campaign. Whether you’re producing B2B or B2C content, there’s room for a bit of personality in even the most serious brand. In fact, a touch of humanity is increasingly essential in the age of authenticity we live in today. While it’s true that too much fun and frivolity can make a brand seem young and immature, the pendulum can easily swing too far the other way, making your brand come across as cold and overly corporate. It takes trial and error to strike the right balance for your business. A great place to start is the “party in the front, business in the back” strategy. Create playful top-of-the-funnel content that directs people to more serious content down the line, and adapt as needed. Please note: While I borrowed the “business in the front, party in the back” tagline (and reversed it) from that infamous ‘80s haircut known as “the mullet”—sported by such style legends as John Stamos, Michael Bolton, and Andre Agassi (who later admitted his was a wig! )—I am in no way advocating for a return of the hairdo itself. Also, this is part of a paid sponsorship between Workfront and Convince & Convert. We love each other!